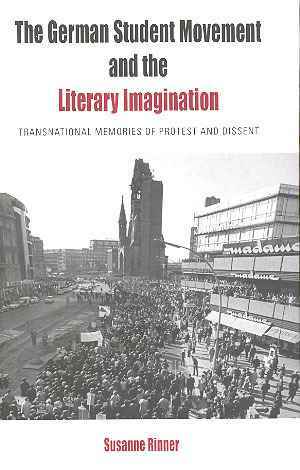 Susanne Rinner’s monograph, The German Student Movement and the Literary Imagination. Transnational Memories of Protest and Dissent, posits that literature plays a key role in the construction of a cultural memory of 1968. The novels of the 1970s and 1990s which form the textual basis of her study are well-known and have received scholarly attention for their representation of the student movement. Rinner’s approach to these works is, however, broader in scope and more ambitious. She reads these fictions as interventions in various public discourses and within current cultural studies paradigms, including post-unification memory discourse; the question of 1968 in the German Democratic Republic (GDR); the student movement’s approach to ”Vergangenheitsbewältigung” and complicated relationship to the United States; and the global dimension of the student movement in light of recent migration history. Rinner presupposes that the counter-cultural upheavals denoted by the date 1968 represent a significant moment in the history of Germany and cites the continuing preoccupation with this historical moment in public and academic discourse as ample evidence for this claim. Rinner’s account of the depiction and function of 1968 in literary discourse focuses on novels written during the heady days of the 1990s, which she identifies with “memory contests” engendered by unification that prompted the rewriting of German post-World War II history. Rinner’s monograph is, therefore, firmly rooted in memory studies and draws on theories of memory by Walter Benjamin, Maurice Halbwachs, Aleida and Jan Assmann and Pierre Nora as well as on the notion of postmemory developed by Marianne Hirsch in the field of Holocaust Studies. Benjamin’s concept of memory as a palimpsest represents the foundation of Rinner’s approach to her overarching analytic trajectory of tracing the various layers of 1968 memories which literary writing uncovers and to which it also contributes. Drawing on the Assmanns’ adaptation of Halbwachs’ theory, Rinner defines her central category of cultural memory in collective terms, that is memory significant for group identity, which is situated as a “site of negotiation” (p. 13) between fiction and historiography. This conceptual move allows Rinner to privilege literature as a medium particularly apt to inscribe memories, and she cites historians such as Konrad Jarausch and Michael Geyer in support of her focus on literary contributions to the cultural memory of 1968. What appears in the introductory chapter as somewhat of a hodgepodge of concepts makes sense when applied in the discussion of individual or groups of literary texts and yields interesting insights into widely discussed contemporary novels. Methodologically, Rinner opts for historically contextualized close readings of exemplary novels rather than a comprehensive overview of novels thematizing 1968. Comparison represents another key analytic tool in her analysis. The most pronounced is her juxtaposition of the literary imagination as it emerged in the wake of 1968, in the early 1970s and in the 1990s. For the 1970s, Rinner engages with Peter Schneider’s Lenz (1973) and Uwe Timm’s Heißer Sommer (1974) regarding the West German incarnation of 1968 and uses for the East German side Irmtraud Morgner’s Salman trilogy whose individual volumes were published in 1974, 1983 and 1998. The main focus lies, however, on exemplary novels from the 1990s: Schneider’s Eduards Heimkehr (1999), Timm’s Rot (2001), Kolb’s Frühstück mit Max (2000) and Emine Sevgi Özdamar’s trilogy which includes Das Leben ist eine Karawanserei (1992), Die Brücke vom Goldenen Horn (1998) and Seltsame Sterne starren zur Erde (2003). The first chapter of Rinner’s analysis successfully demonstrates that it is sensible to conceive of these and other fictional texts thematizing the student movement as a distinct genre, which she dubs the 1968 memory novel. In comparing the two West German novels of the 1970s to those of the 1990s, Rinner plausibly maintains that the earlier novels are more event driven and cast the student movement in a melancholic light in terms of a failed revolution. In contrast, the novels of the 1990s by the very same authors are no longer interested in a story about events “but rather […] creating a memory of the generation” (p. 34). Rinner attributes much discursive power to literary or fictional discourses in producing the trope of the generation of 1968 and argues that this generation began to actively shape the legacy of the student movement since the 1990s. The second chapter provides a close reading of Morgner’s main oeuvre, especially Leben und Abenteuer der Trobadora Beatriz, in order to show East German literature’s participation in both the historical moment of 1968 and the production of its cultural memory. Rinner argues that Morgner’s trilogy creates a transnational geography that extends from May 1968 in Paris and the Prague Spring to the GDR, which she reads as evidence that East German youth as well as artists and intellectuals were highly aware of the student driven upheavals in the West in spite of their inability to engage in protest actions themselves. Rinner also credits Morgner’s trilogy with raising the question of the student movement’s gender blindness on multiple levels. Under the title Transatlantic Encounters between Germany and the United States the third chapter examines another transnational dimension of 1968. This chapter returns to Schneider’s Eduards Heimkehr, which is supplemented with an extensive analysis of Bernhard Schlink’s Vorleser and rather cursory remarks on Kolb’s Frühstück mit Max. Rinner argues that these memory novels construct the United States as a geographical location in which the student activists and the Holocaust survivors meet and as a “lieu de mémoire” in Nora’s sense, albeit with varying meanings for different generations. The fourth chapter is also dedicated to exploring the global dimension of 1968 by investigating the literary contributions to the cultural memory of 1968 by “hyphenated,” i.e. immigrant, authors writing in German. Rinner chose to examine the well-known trilogy of Emine Sevgi Özdamar because it focuses “on the embedded memory of the Holocaust and the Third Reich” (p. 124) and thus engages with debates typically considered to be exclusively German issues. Rinner thereby supports her claim that the perspective of the “hyphenated” authors like Özdamar provides a most fruitful literary elaboration of the transnational dimension of 1968 as well as addressing questions of cultural memory and national identity. Aside from the scholarship of Ingo Cornils (duly acknowledged by Rinner), The German Student Movement and the Literary Imagination represents to date the most extensive study of literature’s multi-faceted negotiation of the historical moment symbolized by the date 1968 and of the discursive struggle over competing inscriptions of it into collective memory. Rinner engages with the existing scholarship on this issue and develops persuasive readings of exemplary literary texts in support of her claims. The volume is addressed to a scholarly audience familiar with German history, especially the history of student movement, as well as with current cultural debates and scholarly paradigms in the fields of memory studies. The ambitious nature of reading a well-researched as well as much debated historical moment though equally well-known literary texts and against the grain through complex conceptual frames of reference appears at first to lead in too many different directions. Even if one might not agree with every detail of her argument, Rinner manages to weave various strands of her analysis together into a stimulating palimpsest of provocative insights into literary discourse’s significance for the construction of the cultural memory of 1968. Sabine von Dirke: Rezension zu: Rinner, Susanne: The German Student Movement and the Literary Imagination. Transnational Memories of Protest and Dissent. New York 2013 , in: H-Soz-Kult, 11.10.2013, <www.hsozkult.de/publicationreview/id/rezbuecher-20198>.